The party does not end at the beach! Just as you return from the outstation hash, we have another fun run planned. March 14 will be the ‘Holi run’ or the ‘Colour run’. 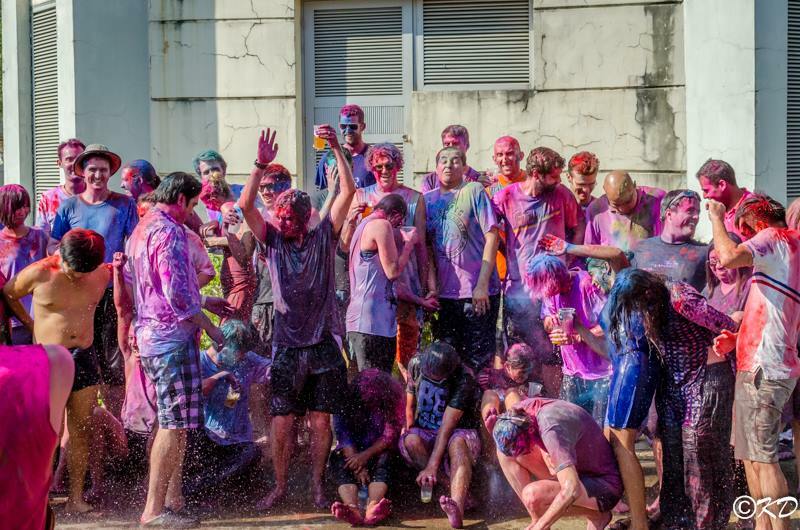 The run will end at the On On venue, where we will continue to play holi & party into the night. It is one of India’s most popular festivals. The festival of colours, Holi celebrates the beginning of spring. It is a lot like the water festival, except we colour each other black & blue too. Be at the hash meeting point at the usual time, your hares will show you the way to the On On Venue. What to Wear to the Holi/Colour run? Please wear clothes you are happy to throw away as you may/will not be able to use these clothes again. Those who do not wish to stay for the On On, do not need to pay the 12,000Ks. We cannot however guarantee that you will not be coloured as on Holi everyone is fair game. Those who will be joining us for the On On please RSVP by March 10 , it is impossible for us to organize enough food / drinks for you all if don’t let us know you’re coming. On On to the Holi run! By the end of the party, you will look like this! Yangon University carpark on University Road between Inya and Pyay Roads.